Havelock Island is a jewel in the crown of Andaman and Nicobar Islands and is named after a British general, Sir Henry Havelock. However, the Indian government is planning to change its name as soon as possible. It is a part of Ritchie's Archipelago and is located at a distance of about 67 km from the capital city, Port Blair. The enthralling island has become a captivating spot of Andaman tourism for its scenic beaches, adventurous activities and azure sea. Consequently, becoming one of the most popular islands in the country. Meagre population on Havelock Island mainly comprises of Bengali settlers. It is one of the places in India where people are concerned about the environment, natural surrounding and as such promote eco-tourism. Havelock Island is home to three most alluring beaches of India. Radhanagar Beach is paved by white sand and the backdrop comprises of lush green forest and is Asia's second most beautiful and cleanest beach. If you love snorkelling and scuba diving this is the beach where you should be. Elephant Beach is called so on account of the 1980's forest department that used elephants to log woods on Havelock Island. It was highly effected by the tsunami in 2004. But now it is very much wanted amongst tourists because of the coral reefs and colourful fishes that are found here. Kalapathar Beach is named after the Kalapathar village which is situated by the beach and black rocks which are seen by the coastline. There are many other beaches which are known by numbers rather than their names. Travellers venturing for this scenic island must be assured of cash they are carrying as there are not many ATM's in the vicinity and very few hotels have the facility of card transactions. Local dhabas and accommodations are mostly found by Vijay Nagar Beach and Govind Nagar Beach. How to Reach: The scenic island of Andaman tourism is easily accessible through ferries. These ferries start from Port Blair and take around 2-3 hours to reach this spellbinding place. Ferry services are also available from Rangat which comes across Neil Island. Government ferries also operate which need to be booked in advance. The fares vary according to the season. Catamaran Ferries are another option which are a bit costly but too adventurous to travel. They are scheduled according to the flight timings and booking for these ferries can be easily done from Port Blair. Weather conditions play a huge role while you are travelling to Havelock. If the weather conditions are not favourable, ferries or boats might not work and one may have to stay back for an extra day or two. Pawan Hans is another option to reach this scenic island. Earlier the service was just limited to helicopter but now tourists from Port Blair can avail 8-seater Cessna seaplane which starts and returns back to Port Blair on the same day. Though it is highly expensive, certain discounts may be available. Once you are in Havelock, what can be more relishing than walking on the silky white sand. Jeeps and buses are available to travel within Havelock. These will take you to Radhanagar Beach and from there to other beaches of the island. Auto rickshaws with standard fare will transport you to various markets and other attractive spots of the scenic island. Bicycles, scooters and motorcycles can be hired with varying amounts. One can enjoy the natural beauty by gliding slowly through the beaches. Private taxis can be booked through the travel agents. What to Do: Havelock Island is one of the most adventurous spots for the bold and daring. Scuba diving is a must do activity here. 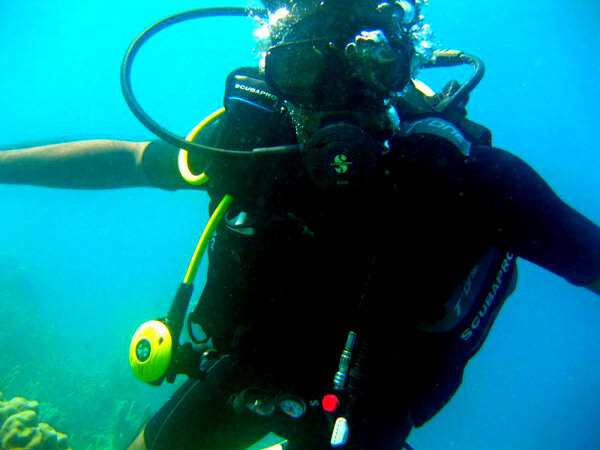 Andaman Bubbles, Barefoot Scuba, Doongi Dives and Dive India are the certified centres which offer you proper equipments and training to enjoy your dive. South Button and Elephant beach are the best places to enjoy scuba diving. Snorkelling is another popular adventurous sport which generally takes place at Radhanagar Beach. Fins and masks are provided and adventurers can see colourful reefs and fishes beneath water. Elephant beach is another venue. Local fishermen also offer an opportunity to snorkel at various locations. Trekking at jungle is tried out by the adventurous folk. If you are halting at The Wild Orchid Resort or Emerald Gecko Resort, you can easily be a part of their jungle treks. Barefoot Eco Tours arrange trek tours apart from kayaking, snorkelling and night camping. One should not miss out mangrove safari and fishing too. Witnessing the beauty of the Glowing Beach at Havelock Island is another unforgettable experience you can gain here. It is the place where you can enjoy bioluminescence in the sea water. Bioluminescence is a natural phenomenon by which light is emitted by planktons living in the water. It generally happens on a hot day when the tide is low and the sky is clear. There are lot many options to eat, drink and relish. Local dhabas serve fresh seafood which one can savour in Havelock. The prices are also reasonable and the friendly host also maintain proper hygiene. Bars located on different beaches of this scenic island gives you an opportunity to intoxicate with the nature. Palm thatched beach huts and shacks are innovative mode of accommodation. Apart from these, luxurious and budget hotels and cottages are also available catering to different kinds of tourists.